It actuall calculates the positions of the source and destination positions of the cells to be merged. References FV_View::findCellPosAt(), XAP_Frame::getCurrentView(), XAP_App::getLastFocussedFrame(), m_iBot, m_iCellDestination, m_iCellSource, m_iLeft, m_iRight, m_iTop, m_mergeType, XAP_Dialog::m_pApp, radio_above, radio_below, radio_left, and radio_right. References XAP_Dialog::getApp(), FV_View::getDocument(), UT_Worker::getInstanceData(), XAP_App::getLastFocussedFrame(), AD_Document::isPieceTableChanging(), m_bAutoUpdate_happening_now, m_bDestroy_says_stopupdating, setAllSensitivities(), and UT_return_if_fail. References XAP_Dialog_Modeless::BuildWindowName(), FREEP, gchar, XAP_App::getStringSet(), XAP_StringSet::getValue(), XAP_Dialog::m_pApp, m_WindowName, and UT_XML_cloneNoAmpersands(). Referenced by AP_UnixDialog_MergeCells::_constructWindow(), AP_Win32Dialog_MergeCells::activate(), AP_UnixDialog_MergeCells::activate(), AP_Win32Dialog_MergeCells::notifyActiveFrame(), and AP_UnixDialog_MergeCells::notifyActiveFrame(). Referenced by AP_Win32Dialog_MergeCells::destroy(), AP_UnixDialog_MergeCells::destroy(), and AP_CocoaDialog_MergeCells::destroy. Method to actually do the cell merge. References _generateSrcDest(), FV_View::cmdMergeCells(), XAP_Dialog::getApp(), m_iCellDestination, m_iCellSource, and setAllSensitivities(). Referenced by AP_Win32Dialog_MergeCells::_onCommand(), s_merge_above(), s_merge_below(), s_merge_left(), and s_merge_right(). 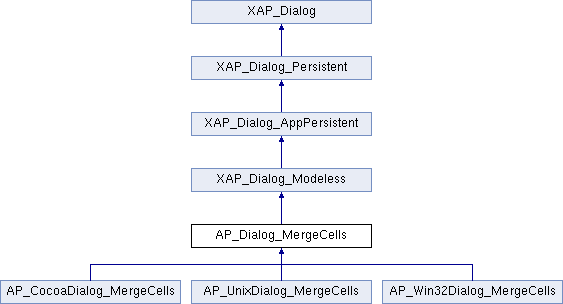 Implemented in AP_CocoaDialog_MergeCells, and AP_UnixDialog_MergeCells. This method sets the sensitivity of the radio buttons to above/below/left/right merges Because we can't merge to the left of column zero for example. Call this right after contructing the widget and before dropping into the main loop. References FL_DocLayout::findBlockAtPosition(), fl_BlockLayout::findPointCoords(), XAP_Dialog::getApp(), FV_View::getCellParams(), fp_Container::getContainer(), fp_ContainerObject::getContainerType(), FV_View::getLayout(), fp_Run::getLine(), fp_TableContainer::getNumCols(), fp_TableContainer::getNumRows(), FV_View::getPoint(), FV_View::isInTable(), m_iBot, m_iCellSource, m_iLeft, m_iNumCols, m_iNumRows, m_iRight, m_iTop, m_pTab, radio_above, radio_below, radio_left, radio_right, setSensitivity(), UT_ASSERT, UT_return_if_fail, and UT_SHOULD_NOT_HAPPEN. Referenced by AP_Win32Dialog_MergeCells::_onInitDialog(), AP_UnixDialog_MergeCells::_populateWindowData(), AP_CocoaDialog_MergeCells::_populateWindowData, AP_Win32Dialog_MergeCells::activate(), AP_UnixDialog_MergeCells::activate(), AP_CocoaDialog_MergeCells::activate, autoUpdateMC(), AP_Win32Dialog_MergeCells::notifyActiveFrame(), AP_UnixDialog_MergeCells::notifyActiveFrame(), AP_CocoaDialog_MergeCells::notifyActiveFrame, and onMerge(). References autoUpdateMC(), m_bAutoUpdate_happening_now, m_bDestroy_says_stopupdating, m_pAutoUpdaterMC, UT_Timer::set(), UT_Timer::start(), and UT_Timer::static_constructor(). Referenced by AP_Win32Dialog_MergeCells::runModeless(), AP_UnixDialog_MergeCells::runModeless(), and AP_CocoaDialog_MergeCells::runModeless. References DELETEP, m_bDestroy_says_stopupdating, m_pAutoUpdaterMC, and UT_Timer::stop(). Referenced by finalize(), and ~AP_Dialog_MergeCells(). Referenced by AP_Win32Dialog_MergeCells::_onCommand(), AP_Win32Dialog_MergeCells::event_Close(), AP_UnixDialog_MergeCells::event_Close(), AP_CocoaDialog_MergeCells::event_Close, and getAnswer(). Referenced by autoUpdateMC(), and startUpdater(). Referenced by autoUpdateMC(), startUpdater(), and stopUpdater(). Referenced by _generateSrcDest(), and setAllSensitivities(). Referenced by _generateSrcDest(), getCellDestination(), and onMerge(). Referenced by _generateSrcDest(), getCellSource(), onMerge(), and setAllSensitivities(). Referenced by _generateSrcDest(), and setMergeType(). Referenced by startUpdater(), and stopUpdater(). Referenced by AP_UnixDialog_MergeCells::_constructWindow(), AP_Win32Dialog_MergeCells::activate(), AP_UnixDialog_MergeCells::activate(), ConstructWindowName(), AP_CocoaDialog_MergeCells::getWindowName, AP_Win32Dialog_MergeCells::notifyActiveFrame(), and AP_UnixDialog_MergeCells::notifyActiveFrame().